Merrie DeStefano works as a freelance writer/editor for Walter Foster Publishing. She used to edit the magazines Victorian Homes, Cottages & Bungalows, and Romantic Homes. She has also worked for Focus on the Family, The Word For Today, and PJS Publications (now Primedia). She lives in Southern California with her husband. Besides reading speculative fiction, she loves to camp in the mountains, walk on the beach, watch old movies, and listen to alternative music. Learn more at Merrie DeStefano’s website. Click here for more stories by Merrie DeStefano. Set in the New Orleans of the future, Afterlife gives us a chilling look at what humanity might become if we developed the technology to transcend death. The Fresh Start company uses clones and memory “downloading” to resurrect anyone with the money to pay for the privilege, up to a total of nine lives. But as we quickly learn, there are so many things that simply weren’t thought out before the technology was unveiled. Waiting for Midnight — (2012) Publisher: From the author of Afterlife: The Resurrection Chronicles comes a collection of 16 short stories, full of the rich prose and plot twists that have become Destefano’s trademark. 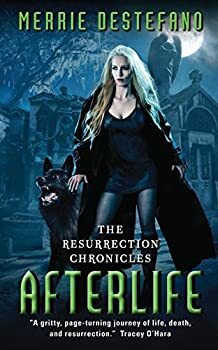 Written to keep you reading all night long, this combination of short stories and flash fiction contains a ghost story, a werewolf story, and a science fiction story, as well as two stories that feature characters from her novels, AFTERLIFE and FEAST. This collection is approximately 70 pages long. Short stories included in this collection: Set on an alien world, “Letters from Home” tells the tale of a mother’s love for her wayward son and the great lengths to which she’ll go to rescue him from another dimension. Learning to Hunt” features Ash, the Darkling dream-eater introduced in Feast: Harvest of Dreams, as he explores seventeenth-century Amsterdam, where his father teaches him how to harvest dreams. “Waiting for Midnight” explores that dangerous territory between first love and obsession, all set in Primrose Wood, a forest where dark magic rules. Fathom (The Chronicles of Crescent Moon Bay) — (2012) Publisher: Turning sixteen can be hell, especially if everyone in town thinks your mother killed herself and your sister. All Kira Callahan wants to do is swim, hang out with her best friend, Sean, and ignore the kids who torment her at school. That is, until one day when she gets invited to a party. For three minutes her life is wonderful — she even kisses Sean. Then somebody spikes her drink and some girls from out of town lure her into the ocean and hold her underwater. Kira soon discovers that the group of wild teenagers who have come to visit Crescent Moon Bay are not as innocent as they seem. In fact, nothing is as it seems — not the mysterious deaths of her sister and mother, not her heritage, not even her best friend. And everything seems to hinge on the ancient Celtic legends that her mother used to tell her as a child. The Plague Carrier — (2012) Publisher: A teenage runaway’s post-apocalyptic world comes tumbling down when she discovers a survivor in a field of dead bodies. Condemned as a runaway and sentenced to work as a Cleaner, fifteen-year-old Anna now spends her days searching for valuables in a field of dead warriors. Her life goes from bad to worse, however, when she stumbles upon a plague carrier, a boy her age who could kill her entire camp with a single drop from the flask he carries around his neck. Approximately 26 pages long, THE PLAGUE CARRIER is the first story in Merrie Destefano’s new series set in a post-apocalyptic United States, where survivors are still recovering from a Civil War. East of the Mississippi, peace reigns and the people are free. But west of the Mississippi is a different story. Here, the countryside is ravaged by erratic thunderstorms and tornadoes, and the inhabitants continue to battle one another using advanced forms of chemical warfare. Here, anyone who breaks the law is sold into slavery, where he must serve in a labor camp until his sentence is fulfilled.